Three women. One stranger in a shimmering silver dress. Whatever binds them together has already destroyed one life. It just might consume them all. Someday, Livvi Gray will break free from her past. Someday, she will escape her recurring nightmare about that stranger in a shimmering silver dress. Someday, she will have a family of her own. Now she’s found Andrew, and someday seems to be right around the corner. But there’s so much Livvi doesn’t know. Shortly before her thirtieth birthday, she will come face-to-face with the stranger from her dream-an encounter that will alter Livvi’s future and crack open everything she knew about her past. Livvi is swiftly moving toward the ultimate turning point in her life-and she’s not the only one. Linked by an unforgettable mystery, photographer Micah and young mother AnnaLee are also being rapidly drawn into a web of devastating secrets about the unexpected ways in which we choose to protect-and betray-the people we love. Wow, this book kept me reading until the wee hours of the morning. Absolutely riveting! 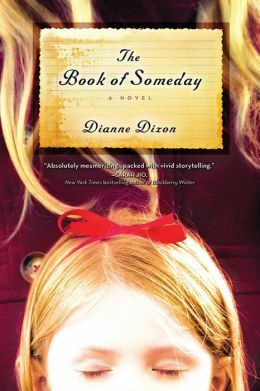 THE BOOK OF SOMEDAY is about three compelling characters, Livvi, Micah, and AnnaLee, who are mysteriously connected by a woman in a silver dress and pearl-button shoes. Each chapter is told from the point of view of a different woman. As their stories are told, small pieces of the puzzle are revealed, leading up to a poignant conclusion. Livvi, the survivor of emotional and physical abuse as a child, is longing to fulfill her “someday” dreams of finding love and having a family. After receiving devastating news, Micah, a beautiful and successful photographer, is on a quest to find someone who believes she matters. And AnnaLee, a loving wife and mother, is perhaps the biggest mystery of all. Finding out what dark secret bound these women together kept me turning the pages! The book is written in third person present tense, which I don’t always like, but it worked well here. It made me feel like I was right there with the characters, waiting on the mystery to be revealed at the same time they did. The characters made questionable choices that frustrated me at times, but I suppose that made them realistic. THE BOOK OF SOMEDAY is a heart wrenching story of loss, forgiveness, surviving, and moving on. I’m keeping an eye out for more from Dianne Dixon. Highly recommended! This entry was posted in Contemporary Fiction, Reviews, Women's Fiction and tagged 4.5 Stars, Dianne Dixon. Bookmark the permalink.